Claremont Farm in Bebington has joined forces with B&M Waste Services to enhance recycling levels to do its bit to help save the planet. The family-run farm, now in its fourth generation, has been growing fruit and vegetables since 1906 and has recently expanded its shop and opened a café which serves home-grown produce. One of the farm’s directors, Andrew Pimbley, told JMU Journalism: “We have always been environmentally-conscious. The farm is part of the higher level environmental stewardship scheme, which means that we pay specific attention to the environment and the wildlife, so we have always made an effort to be environmentally friendly. 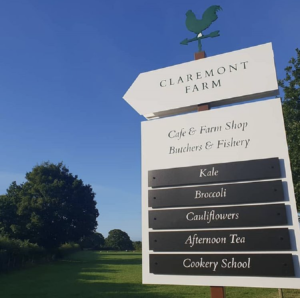 Home to the world’s first pop-up asparagus restaurant, Claremont is a firm favourite among local restaurants, retailers and shoppers for its home-grown produce and has been at the forefront of Merseyside’s biodegradable movement. Claremont has teamed up with Birkenhead waste service, Bagnall & Morris, to ensure that its produce is recycled or disposed in the correct way. B&M Waste has helped Claremont move to segregated waste streams to ensure that the farm is able to recycle everything that it can. The Pimbley family hopes that the movement will inspire businesses alike and lead others to make a conscious effort to be more environmentally safe.